of 2006, when the Fed raised short-term rates but long-term rates didn’t follow, appears to have been the result of an unusually low term premium, as can be seen in Figure 3. The “global saving glut” and the associated demand for Treasuries by foreign central banks and sovereign wealth funds may account for the low value of the term premium around 2006. Reduced uncertainty about the course of interest rates, as indicated by the low value of the MOVE index in 2006 (Figure 3), was likely also a factor. After lowering short-term interest rates nearly to zero in December 2008, the Fed sought to ease policy further by buying large amounts of longer-term securities (quantitative easing). Quantitative easing increased the demand for longer-term government securities, thereby lowering the term premiums on them. Abrahams, Adrian, Crump, and Moench, in their research referenced above found that the term premiums on ten-year Treasury securities fell, cumulatively, by about 1.1 percentage points on days that quantitative easing measures were announced. Changes in regulation and market practices also affect the demand for safe, liquid assets, such as Treasury securities, lowering their term premiums. For example, new regulations require banks to hold ample liquidity and securities dealers to post more collateral in derivatives transactions. Insurance companies and pension funds also face rules that effectively require them to hold significant amounts of safe, longer-term bonds. This mandated demand seems likely to put downward pressure on longer-term yields for the foreseeable future. What’s the bottom line? 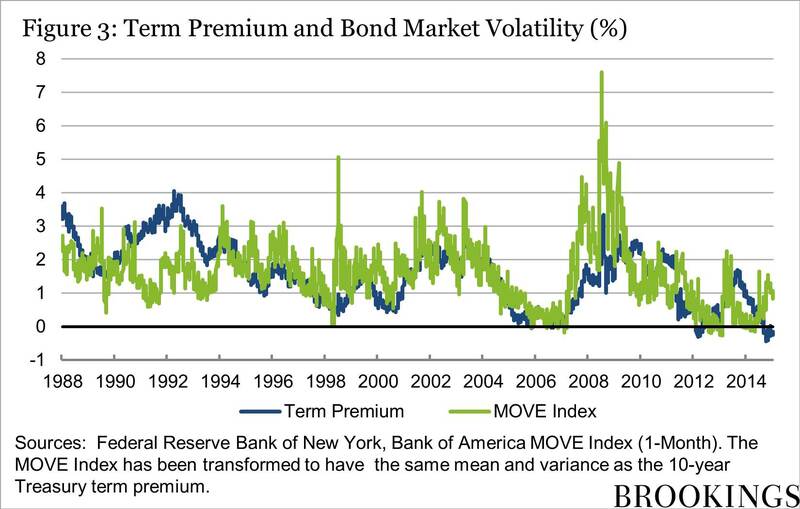 Overall, the behavior of term premiums helps explain the generally low level of longer-term interest rates in recent years (together, of course, with subdued inflation expectations and the market’s expectation that short-term rates will also remain low). The low level of term premiums in turn reflects a number of factors, including: minimal investor concern about inflation; relatively low uncertainty about the likely future course of interest rates (as shown by the MOVE index in Figure 3); a strong global demand for safe, liquid assets (for use as international reserves, for example, and to satisfy regulatory requirements); and quantitative easing programs by central banks. What about the decline in longer-term yields since early 2014? 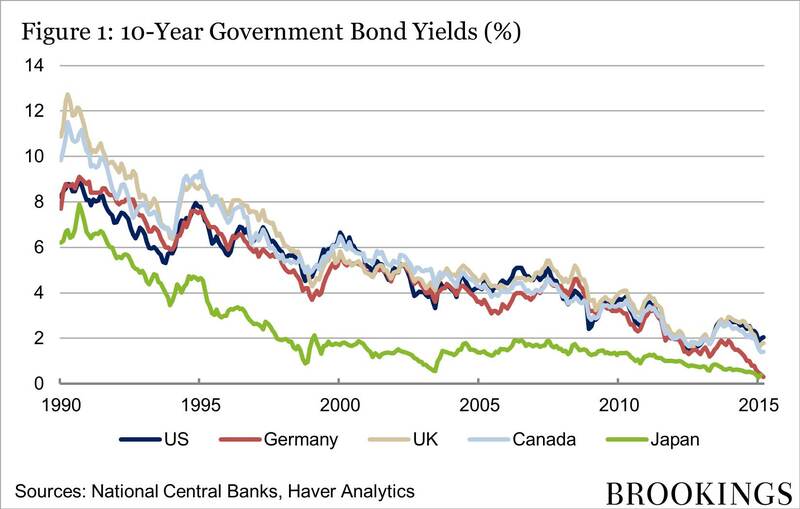 In the US at least, that decline is somewhat surprising, as economic fundamentals have recently seemed more consistent with rising, not falling, longer-term yields. The year 2014 was a good one on the whole for the U.S. economy, with three million jobs created, and longer-term inflation expectations appeared to remain stable. By the process of elimination, with fundamentals stable or improving, much of the decline in yields over the past year must reflect a sharp drop in term premiums. That’s in fact what Figure 3 shows. Figure 4, provided by Tobias Adrian, takes a closer look at some components of Treasury yields since the beginning of 2013. The 10-year yield, in green, rose sharply during the taper tantrum of 2013, then fell through 2014. The dark blue line shows the estimated term premium. 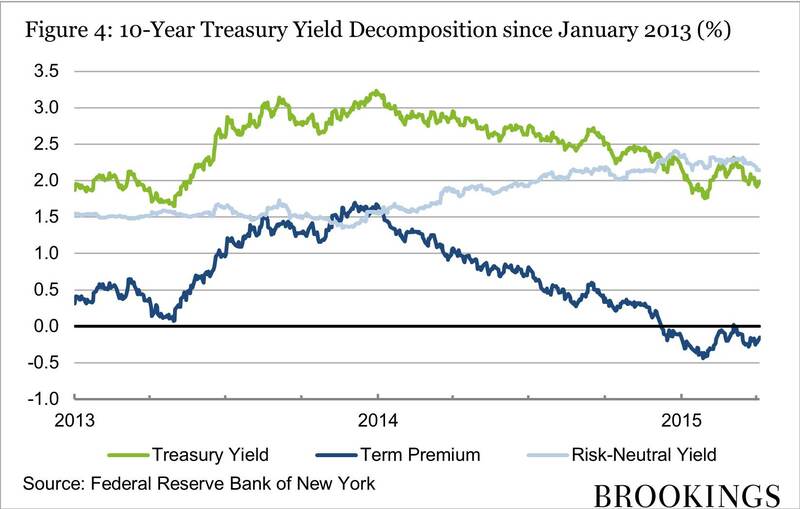 The difference between the yield and the term premium is the risk-neutral yield, plotted in light blue in Figure 4. The risk-neutral yield, an estimate of what the 10-year Treasury yield would be if investors were indifferent to risk, actually rose through 2014, implying that the recent decline in yields is entirely due to a falling term premium. That naturally raises the question of why the term premium has recently fallen by so much. The answer is not obvious. Fed policy doesn’t seem to explain the decline, as purchases of Treasuries under the quantitative easing program wound down last year. The MOVE index suggests that uncertainty about bond yields has not declined appreciably over the past year (see Figure 3). Regulatory changes have increased the demand for Treasuries, but those rules are being phased in over a long period and are thus not good explanations of the sharp recent swing in term premiums. Two possible explanations for the recent moves come to mind. First, during 2014, economic weakness outside the US, especially in Europe, increased the expectation of additional quantitative easing abroad. In January 2015 the European Central Bank did indeed announce a substantial program of securities purchases. The anticipation of these purchases, together with the ongoing central bank purchases in Japan and elsewhere, may be “spilling over” into the demand for US Treasuries, pushing down their term premium. Second, the surprising decline in the price of oil occurred at about the same time as the decline in longer-term yields. Falling oil prices may have reduced investors’ perception of longer-term inflation risk while also signaling weakness in the global economy. Neither of these explanations is completely satisfying. 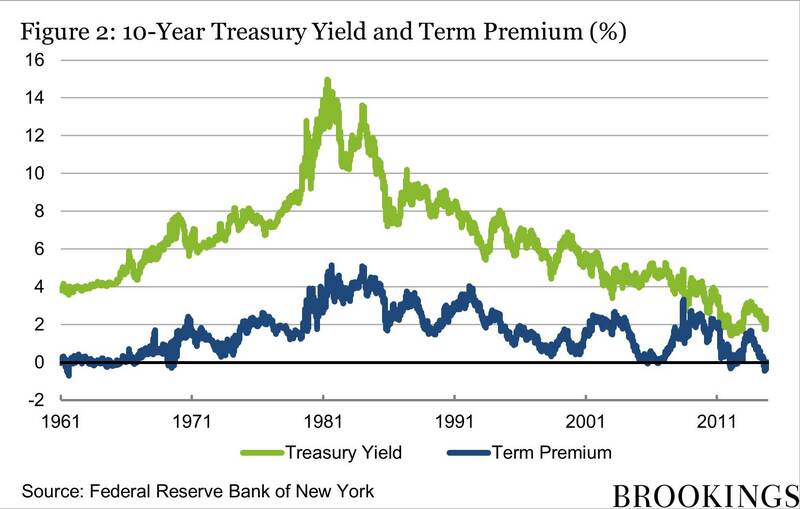 Thus, the recent decline in longer-term yields and term premiums in the US remains something of a puzzle.